Made at a quilt retreat in Mt. Shasta given by Linda Ballard, I changed the name of this quilt to "Tying the Knot on Country Crossroads" and gave it to my niece, Carrie, when she married Ryan, July 1, 2000. This queen size quilt is hand and machine quilted. Below is a detail of the heart on the pillow runner (the runner has two fabric 'slings' on the back to hold pillows and thus acts as a sham). 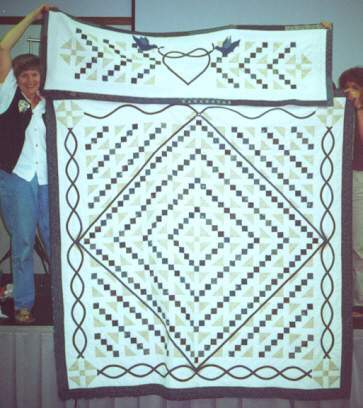 Exhibited in the 2001 Annie Star Quilt Show. The table runner wedding quilt for Jesse and Loeta (Oviedo) Robles was designed to match their choice of linen napkins which were a dark green. The accent of purple picked up the lavender color in their potholders and kitchen towels. 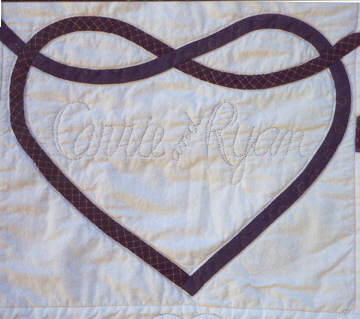 Hand quilting included hearts in the corners and echo hearts at the edges. 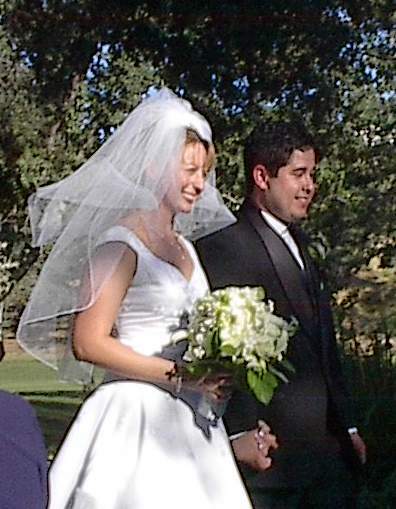 They were married August 25, 2001 at Canyon Oaks Country Club, Chico, CA. Special guests included many of Loeta's paternal relatives from Peru, South America. Tom and I drove around the United States in the spring of 1969 for our honeymoon. When we returned to our US Forest Service cabin in Sly Park, CA (where Tom was working), I used slides from our trip and painted squares of muslin with dye. For the sashing, I used scraps of fabric from skirts and dresses I'd made for myself. The border and the back are bedsheets and the batting is a thermal blanket. I tied the quilt. Sometime I would like to remove the sheets and blanket and quilt the top correctly. From top left the squares are... the back of our Mustang, the Grand Canyon, Carlsbad Caverns, the Cowboy Hall of Fame, the Houston Astrodome (and a baseball signed by Clay Carroll, pitcher, that he gave us as a souvenir), a Florida beach, the Washington Monument, a wine bottle and view of the Fingerlakes region of New York (where we stopped for a visit with Constantine Frank, an enology professor Tom had while at UC Davis), the cabin we stayed in at the Kentucky Caves (with racoon raiding our garbage), St. Louis where we saw the Cardinals play, an antique school desk we got from Bemidji, Minnesota (Tom's mother's home town, where I met and we visited with family), and finally home to our US Forest Service cabin. 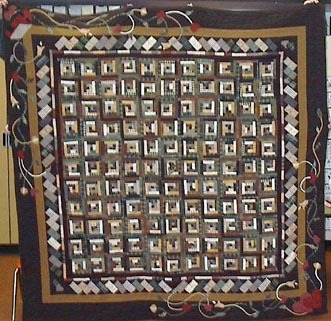 Made in 2000 for my daughter's wedding (September 16, 2000), this was a foundation pieced quilt pattern my Karen Stone. 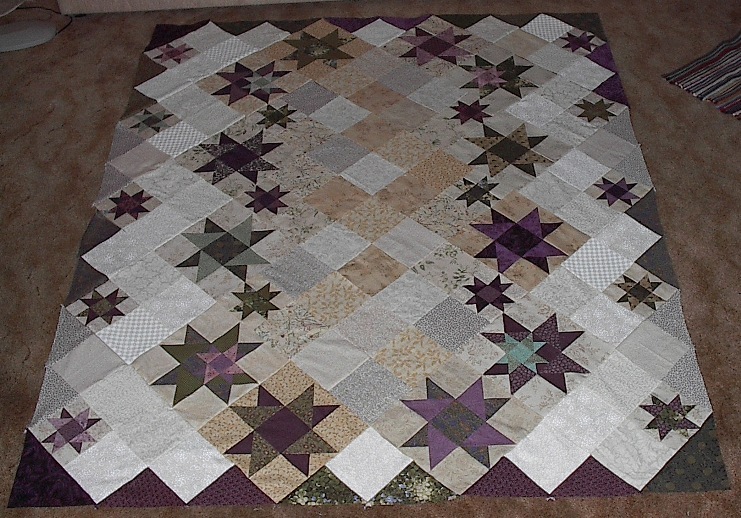 I bought the pattern when Karen Stone came to speak to our Annie Star Quilt Guild (Chico, CA) and probably never would have made the quilt unless Lani and Briny had not chosen it for their wedding quilt; I'm glad they did! The label included a copy of their invitation and their wedding program along with details about the actual quilt. 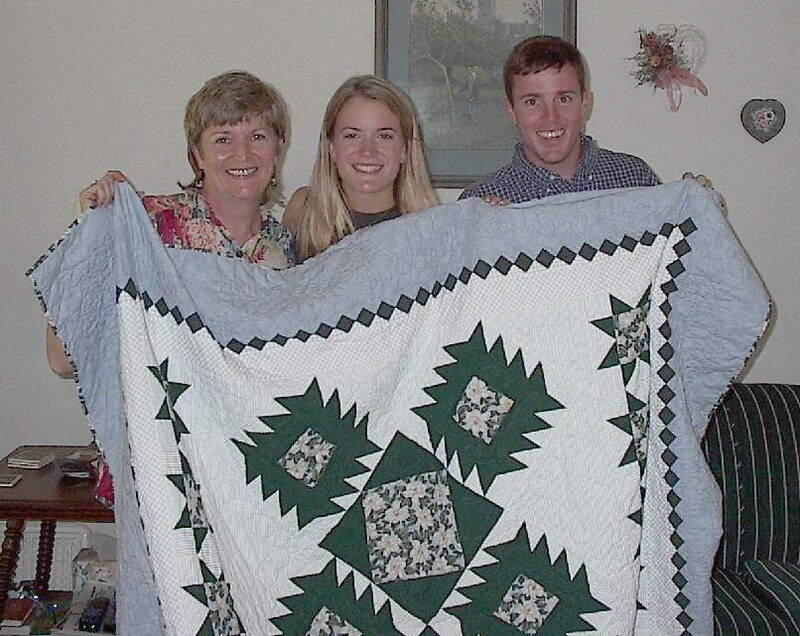 The log cabin pattern was used for the center of my son, Adam, and daughter-in-law, Julia's wedding quilt. 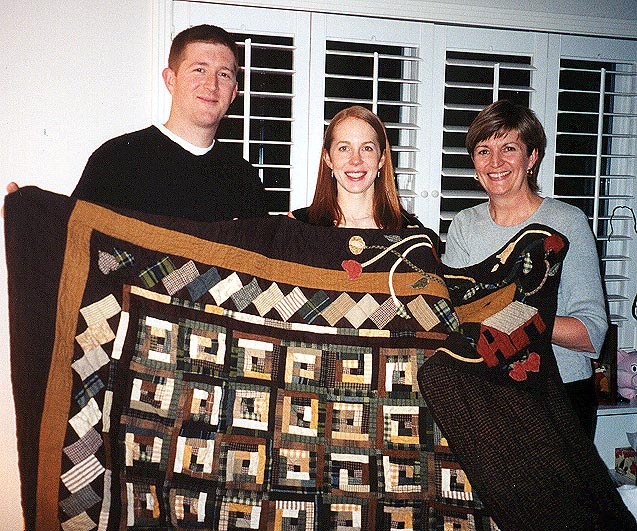 The quilt is made mostly of flannels, including pieces of two flannel shirts that belonged to Adam and Julia. 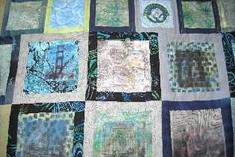 The queen sized quilt also has applique in the border. The barn in one corner is a replica of the barn at my parents' home where Adam proposed to Julia...ergo the title of the quilt. The label includes a copy of their wedding invitation and copy of a portrait they gave my husband and me for Christmas, 2001. 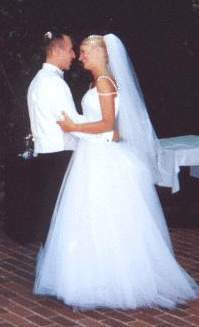 They were married Saturday, January 19, 2002 at the Holy Redeemer Church in Portland, Oregon in the presence of immediate family members. 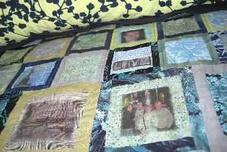 The quilt I made for my niece, Jenny Roney and her husband, Dave Fipp, was from a Linda Ballard retreat I attended in Mt. Shasta. 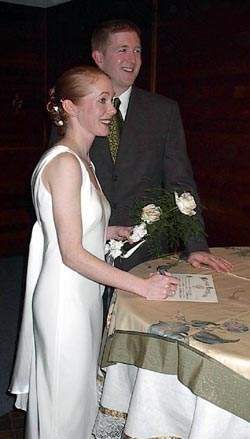 Jenny and Dave were married July 6, 2002 in Chico. 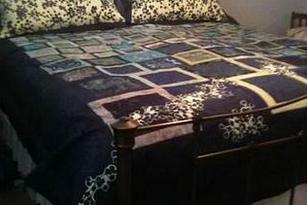 The queen size quilt was hand and machine quilted. Two matching pillows were made to add to the top of their bed. 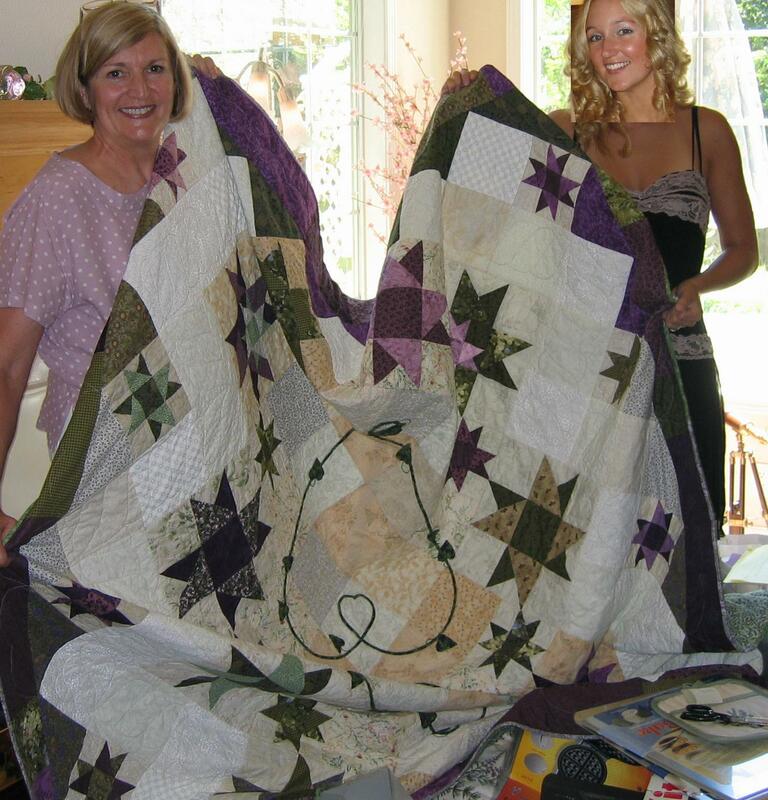 The quilt I made for my niece, Megan Roney was from a book my friend, Bonnie McWilliams and I purchased in Mt. Shasta. 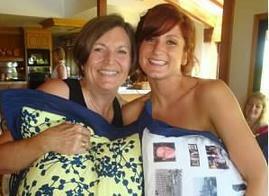 She made a wedding quilt for her daughter, Cari. The book is COOKIES 'N' QUILTS by Judy Martin and the quilt pattern is "I Have a Dream." 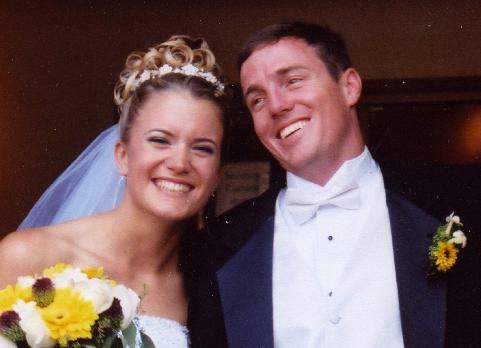 Megan was married August 28, 2004 in San Luis Obispo. 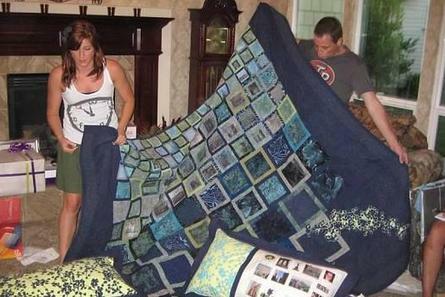 The marriage didn't last, but the quilt did. The queen size quilt is slightly different from the original pattern as I wanted to applique the heart in the center. 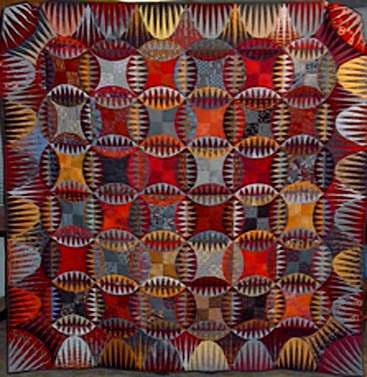 The quilt was machine quilted. 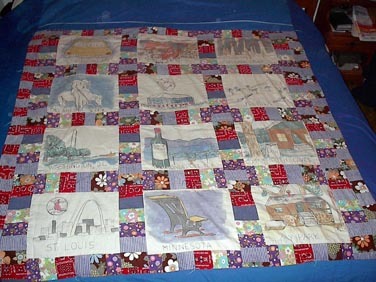 The photo below shows the quilt top before borders were attached and before the center hearts were embroidered. While working in New York, Sonnet met and fell in love with Chris O'Kane from Ireland. 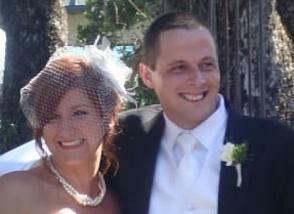 They were engaged in Chicago and married July 17, 2010 in Chico, CA. When I asked Sonnet for suggestions for her wedding quilt, she gave me fabric line and color and lots of pictures of her and Chris and their times together. She also told me New York, Chicago and San Francisco were meaningful to them. 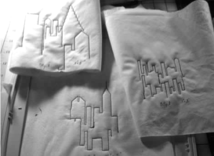 SOOO, I used the colors she liked and some of the fabric line in the piecing of the quilt and then I designed quilt patterns for the blocks…Golden Gate and Brooklyn Bridges and the skylines of their favorite cities. Making a king size quilt took a while and it wasn't ready for her wedding shower, but the two pillow shams were. (See photo of Sonnet and me holding shams showing front and back... which was covered with photos that also appear on the quilt). Sonnet is our youngest niece and she and Chris now (2014) have a beautiful little girl, Scarlett! 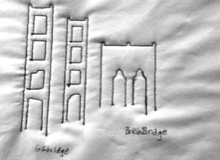 Bridge and skyline quilt designs. Sonnet and Chris opening their quilt after the wedding and before going home to San Diego. 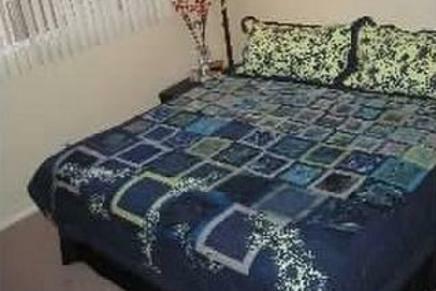 The quilt on their bed. Megan has now purchased a home of her own! This is the runner I made for the foot of her bed.